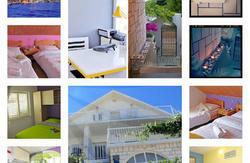 Welcome to Rooms ''Sunce'' Island Residence on the Island Brac - Supetar - Croatia. Comfortable and modern budget accommodation in a unique and home-like atmosphere. Easy access from Split by ferry boat. Great discounts for bike rentals - Rent-a-bike office in the same street! Throughout 2014. significant improvements have been made to bedrooms and bathrooms especially!! Rooms ''Sunce'' Island Residence has several large terraces with magnificent view over the village and harbor. Distance to the beach is approx. 6-10 min walk, to restaurant 5 minutes walk, to supermarket 10 minutes walk, and to the town center 10-15 minute walk. ''We had a great stay at Sunce House, Brankica was awesome and picked us up from the ferry port - even though it's only about 10 min away! We shall be very happy to hear your review of Rooms Sunce which will help us further develop our Hostel. We offer free pick-up upon arrival in the ferry port!!! - just send us your arrival time by sms/e-mail/Whatsapp/ one day before arrival. You will see our contact details after booking. If you are coming to the Residence after 22:30 on the arrival day, or by the last ferry from Split to Supetar at one o'clock in the morning we will apply a 20 Euros fee for a late check-in. When you are coming to the ferry port you need to go in direction of the town center, walking on the promenade through the town, passing by the bank, bistro Palute, some pizzerias and cafes, always by the coast, you will pass by the post office and Splitska banka, after 3-5 minutes you will pass by cafe bar's 'Kalambera', 'Day'nite','Pizzeria & Bar 'Rosso'. On the corner where the 'Bistro Neven' is TURN INTO THE BANA JOSIPA JELACICA STREET. Just go straight up and you will come to the crossroads where writes 'Car wash' on the left house and ''Rent-a-bike ''ACF'' on the right house, keep going straight up between two marked houses. After 5 minutes walking you will come to number 36 of Bana Josipa Jelacica street, then just turn left and ''Rooms - Sobe Sunce'' is the 2nd house - number 39a. Do not go forward after number 36, just turn in the left street. ***If You are coming with car, drive from the ferry harbour straight to the round-about and then please follow the signs for ,''Waterman'' resort and ''Pansion Palute''. When You arrive in front of ''Pansion Palute'' turn in that street, keep driving until You see advertisement for ''Rent-a-bike ''ACF'' and ''Car wash'', then turn up on the right hand, drive straight up about 200 meters and by the number 36 of bana Josipa Jelacica street, turn left and ''Rooms Sobe Sunce'' is the 2nd house - number 39a. Please note, we do not accept credit cards. Cancellation or reduction in numbers must be notified 72h in advance. Only cancellations sent by e-mail will be accepted!! Room can be at disposal after cleaning on the day of arrival (latest till 14:00). Rooms must be vacated till 10:30 on the day of departure. Guests are responsible for any damages of the house and furniture, any damage will be charged.